The colour of the Virginia creeper on my pergola is magnificent as are all the shades of autumn around us at this time of year. I know I have to go out and tidy the fallen leaves up, there’s bulbs to be planted and there’s pruning to be done but it is very wet and my thoughts are turning to indoor winter activities as I watch the autumn leaves falling off the trees. The hedgerows are loaded with hips and haws and there is a very busy squirrel running around the garden burying his winter supplies. There will be lots of little oak trees for me to dig up next year. During the war when there was no oranges or lemons being imported the country had to find an alternative source of Vitamin C to give to the children and so they paid people to collect rosehips, which were then turned into rosehip syrup. 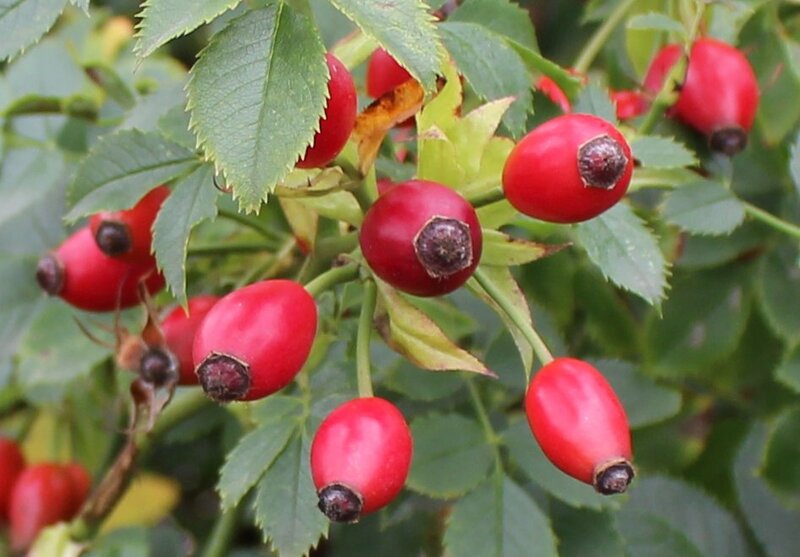 Rosehip syrup was a cure all in our house in the 50’s and at this time of year rosehips were collected, boiled up and we were never short of a bit of Vitamin C over the winter months. You can buy it in a bottle now very cheaply so I’ll leave them to the birds. Every year when the blackberries were ripening in the fields my family would pile themselves and every bucket and pan we owned into my dad’s old car and spend the day picking blackberries. This was known as Blackberry Sunday. Every container was filled to the brim with big juicy blackberries as we scratched ourselves to ribbons trying to get to the best ones which were always out of reach. The following week was a hive of activity as my mother made mountains of blackberry jam and this was our primary source of Vitamin C for the months to come. Blackberry and apple crumble and bread and butter with blackberry jam was on the menu until it ran out but it was also given away to neighbours and relatives and there was always a jar for Harvest Festival. My parents always seemed to choose a sunny Sunday for the outing and as I was so small the fields and bushes seemed so big. There’s a private hospital built where the blackberry bushes used to be. Can’t help but smile when I drive past it. This year we have done very well for berries. We have had loads of strawberries and raspberries but this year the farmer has not been too quick to cut back the blackberry bushes behind our house and we have been able to freeze loads for crumbles in the coming months. A few years ago a colleague gave me some golden raspberries. I really don’t like them but the husband loves them. They seem to like the soil and grow everywhere, including the lawn, and their days are numbered. Last year the husband was given a load of berry bushes by a neighbour. He couldn’t remember what the neighbour said they were so we called them Burberry’s until they fruited so we could see what we had got. We appear to have been given tayberries, boysenberries and a gooseberry bush. The tayberries were lovely, gooseberry has not fruited yet and the jury is out on the boysenberries. They look lovely but are deceptively bitter. 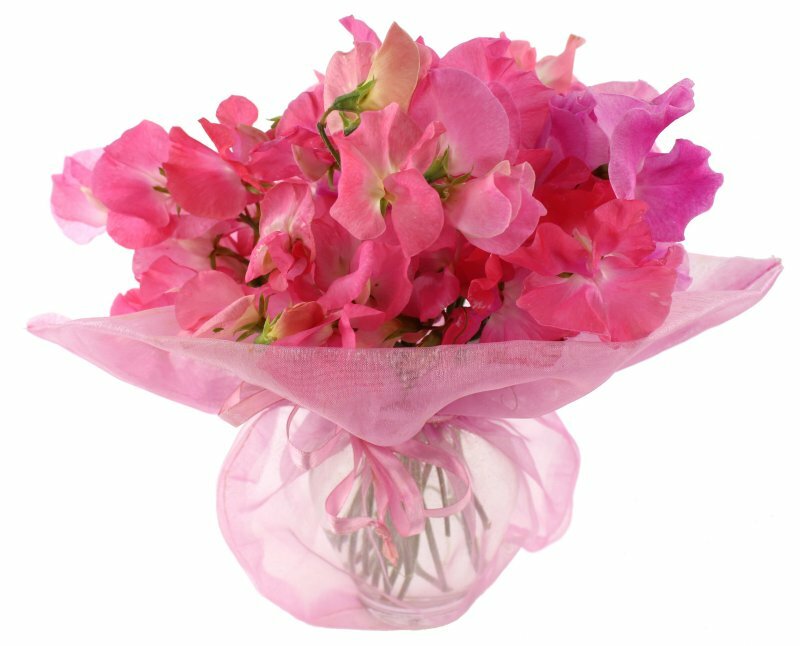 I have lots of favourite flowers but sweet peas have to be my most favourite. I always have some nestling amongst the vegetables. I was a little late putting them in this year but they did not disappointment and the colours have been magnificent. I was always told to dig out a trench and line it with newspaper then fill it with manure before planting. I still do this but haven’t a clue why. I have also been told the more you cut them the more they will flower but as they are grown for cutting this is not a problem. Although they don’t last very long in the house, the scent is magnificent. Native to Sicily and the Aegean Islands, it is an annual climbing plant, which comes in a variety of colours. This year I have bought separate coloured seeds and I planted them with white at one end ranging through every shade of pink and purple with a dark purple, almost black shade at the other end. I also have perpetual sweet peas in other parts of the garden, white and pink. They come back every year and the one I have planted on the back fence always looks magnificent and are especially lovely as a cut flower in the house. 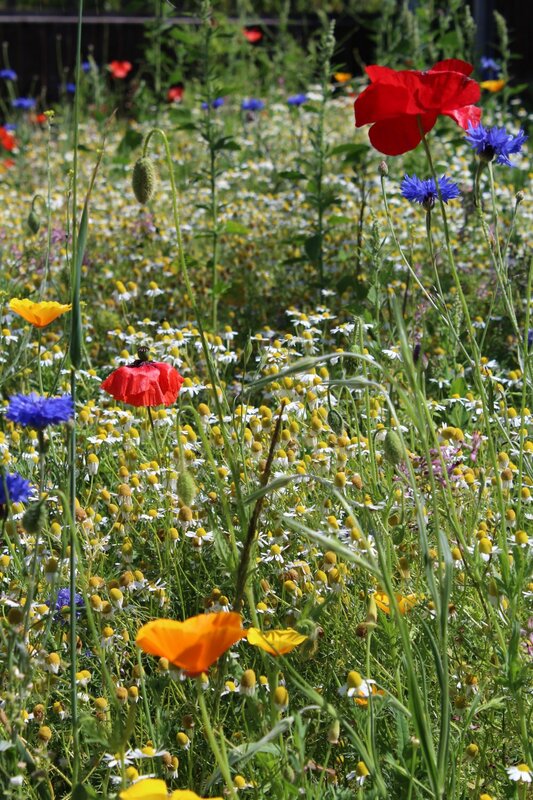 This year we decided to create a wildflower garden at the side of the allotment. The husband did the hard graft, turning the bed over and flattening it and we chose a mix of grasses and wild flowers, which we got off the internet. I was really excited when the first green shoots appeared, with a vision of tall meadow grasses intermingled with white daisies, cornflowers and poppies. Then reality hit. All I seemed to have was a lot of daisies, the type that I am constantly weeding out of the flower beds and nothing else seemed to be growing. The wildflower garden became a haven for a lot of frogs and the bees loved it so I decided to weed out the daisies very slowly so as not to disturb their habitat. Strimming has become a little hazardous this year due to the number of frogs living in the grass between the raised beds on the allotment and I spent quite a bit of yesterday explaining the health benefits of living in the wildflower garden to several frogs whilst slowly guiding them towards it. Fortunately we had no accidents. I decided to do the big butterfly count this year. The weather has been so poor that I had to wait a while for a sunny day and was really surprised how few we had in the garden this year. Standing for 15 minutes looking at the wildflower garden two landed and two flew by. I also counted in one which had gone to sleep in the downstairs toilet and which the husband released just as I was counting. Thinning out the daisies very slowly has now paid off and the grasses have started to grow. We also have a lovely display of poppies and cornflowers. It looks lovely but I have to be careful weeding out the daisies as it is covered with bees. One thing I can grow in this garden is radishes. I just put a third of a pack of seed in every few weeks and we are kept with radishes for the whole of the summer. My favourite are English Breakfast but I am happy to sow other varieties when I see them in the supermarket. They are quick to germinate and can be harvested six weeks or so after sowing. They need to be harvested whilst they are still young and fleshy and they go woody very quickly and are not nice to eat. 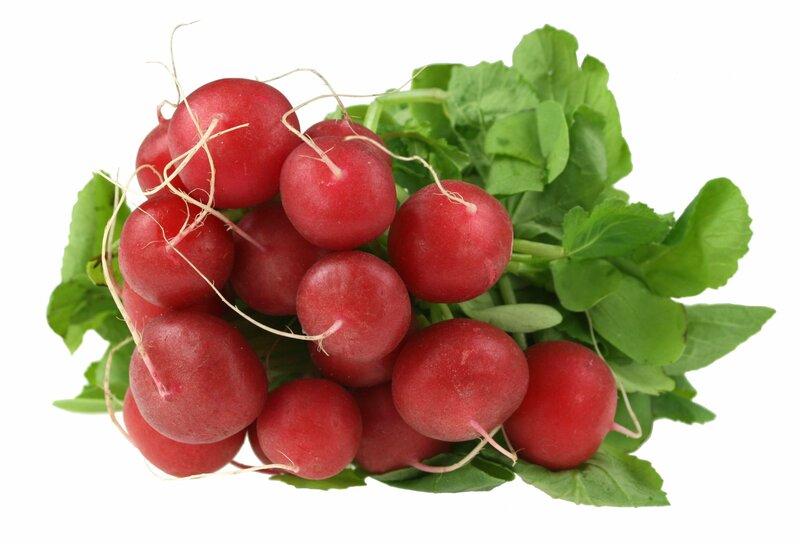 Radishes are a good source of Vitamin B6 and riboflavin, folic acid, potassium and calcium. They are low in calories and used mostly in salads. As we have so many of them I would like to find another use for them but other than carving them into decorations, I just use them in salads. I sow radishes in drills alongside loose leaf lettuce and spring onions. This rotates all three crops and as the radishes come up so quickly they act as a marker for the other crops. I also sow them in spaces when other crops have been harvested to give us radishes throughout the summer months. I have been doing a bit of research into English Breakfast radishes and find that I should be calling them French Breakfast. Apparently they can also be sliced in half and sautéed in butter. I think I’ll give it a go – maybe with a bit of garlic. I have a lovely blossom by the front gate. It has been there ever since I moved into the house. I have never been sure what it is – it has reddish and sometimes green leaves and a beautiful pale pink blossom. I like it because is flowers very early. 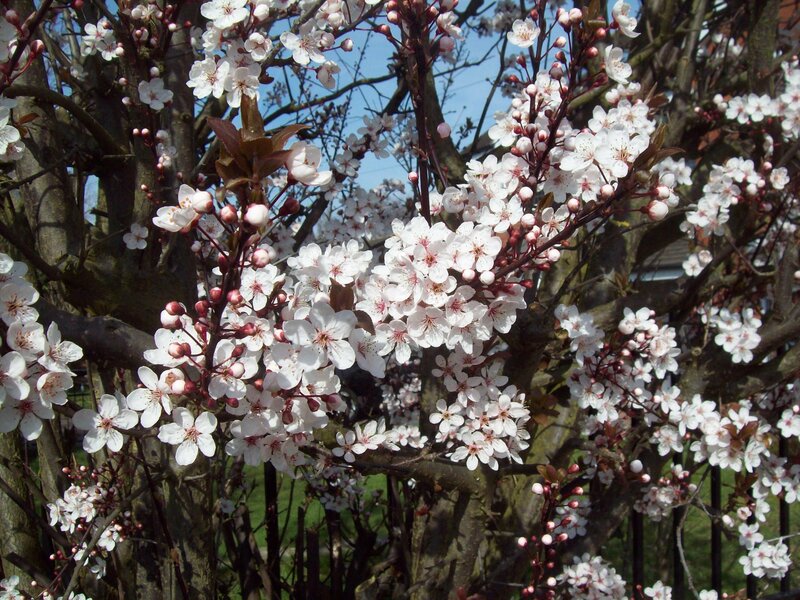 One minute all we have to look at in the garden is bare sticks and in a blink of an eye the blossom appears to herald the start of spring. Its very short flowering and then it is gone. Following on its heels all the trees in the road come to life, cherry and almond blossoms, followed by the forsythia and the purple magnolia. I have never known what this tree is but once enjoyed I cut it back and forget about it until the next year. I walk past it every day on my way in and out of the house but once cut back I have never looked closely at it. This year I have more time and looking up was amazed to see it has produced purple plums. They are only small and very sweet. Wow. Fancy me having a purple plum tree by my front gate and I never even knew it. There is nothing like the taste of a home grown strawberry, picked and eaten on a sunny June day. Strawberries like the conditions in my garden. The first strawberry bed was put in five years ago and a second created because we were overrun. Each year I can’t wait for the flowers to appear. Before we know it we are deluged with juicy red strawberries. Everybody we meet for the next fortnight has to have a dish full of strawberries. We get sick of picking them and sick of eating them. The freezer is full of strawberry sauce and we run out of people to give them to. 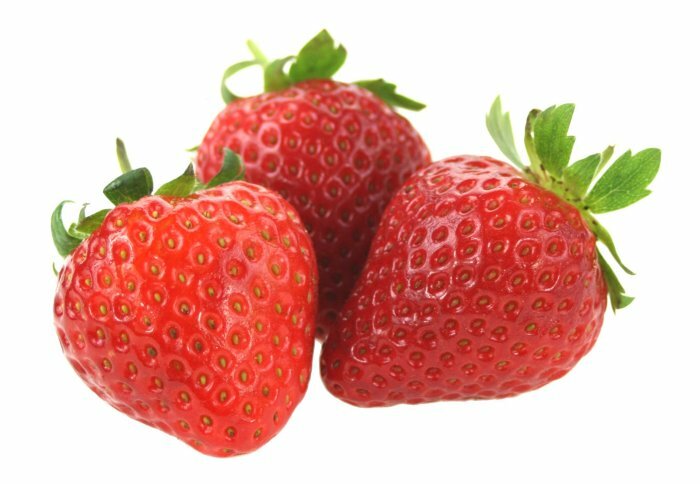 Strawberries are a good source of Vitamins C and K and medicinally have been used to help with digestive ailments. 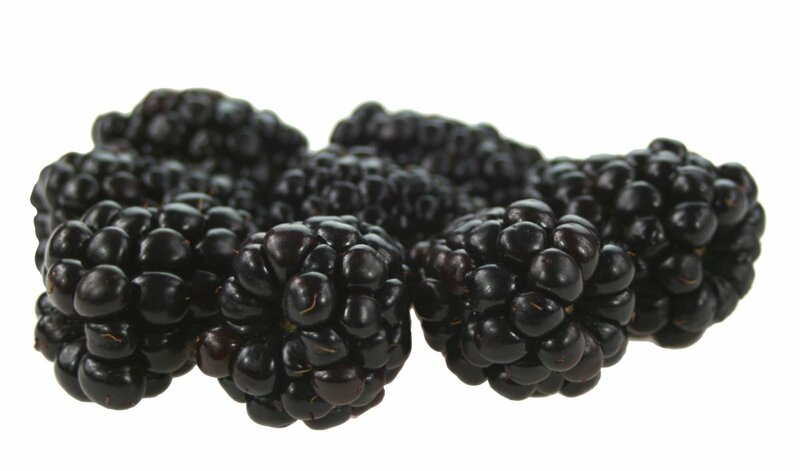 They contain antioxidants which are thought to protect against heart disease, cancer and inflammation. The strawberries are ripe, the sun’s on my back, what more can a girl want.